When one thinks of the musicals of Stephen Sondheim (FB), one often thinks of theatre in the large. The full size Broadway stage, houses with over 800 seats, fully executed scenery and staging. But often one gains a greater appreciation of Sondheim in the small staging, the intimate theatre environment. Think about small intimate creative stagings of Into the Woods, Sweeny Todd, or Assassins: these often provide insights and understanding that the Broadway staging doesn’t give. Intimate staging of Sondheim’s successes are somewhat easy to find. Stagings of the shows that fared less well on Broadway — that’s a different story. Take Pacific Overtures, for example. First produced on Broadway in 1976, it ran for 6 months (and subsequently had a mounting at the LA Civic Light Opera later that year). I don’t have a recollection of the LACLO performance; it is possible that I didn’t go to it (I do remember the show after it, Irma La Douce). It’s had a few mountings on Broadway or Off-Broadway since then, and there have been even fewer mountings in Los Angeles. The last mounting was in 1998 by the East-West Players. So when I saw that the Chromolume Theatre (FB) 2017 season announcement included Pacific Overtures, I was intrigued. Chromolume is an under-50 seat theatre — how the hell were they going to pull off a full Sondheim musical — especially one as complicated as Overtures — on a small black box stage with no fly space and limited cast size? Saturday night we found out. The answer is: they pulled it off by embracing the minimality in the staging, instead of trying to duplicate the grand Kabuki stylings of the original. There are still Kabuki-ish elements, to be sure; however, there is no use of traditional Kabuki whiteface, and there are no set stylings to speak off. For me, the minimalism worked. It felt … Japanese in styling, although I must admit that I am far from being an expert — or even familiar — with what is traditional Japanese style. From reading the background on this story, that was Sondheim’s intent: to provide a Westernized version with a Japanese feel. However, in today’s sensibilities, it does raise some interesting questions of cultural appropriation that, given the underlying message in the story, create an even more interesting contrast and echo. The message in the story — that’s right, I haven’t explained that yet. Pacific Overtures — with music and lyrics by Stephen Sondheim (FB), book by John Weidman, additional material by Hugh Wheeler, and original orchestrations by Jonathan Tunick — tells the story of the (re-)opening of Japan to Western culture in the late 1850s and thereafter (for those that remember the miniseries Shogun, this is the reopening after the post-Shogun isolation). It begins with the arrival of Commodore Perry to Japan in 1853, and looks at the reaction to that arrival in the traditional Japanese culture of the Emperor and Shogunate — a culture that had been isolated from other nations for over 250 since the Spanish and Portuguese were expelled (i.e., the Shogun period). It also explores the exploitation and westernization that occurred thereafter — often in the names of “commerce”. [As an aside, it created an interesting parallel with the gentrification occurring today in South LA, where again predominately white men are exploiting a culture seen by implication as inferior and worthy of updating.] The musical ends with a political commentary on Japan’s success, adopting a Western commerce with a uniquely Japanese attitude, often beating the West at their own game. The means of telling the tale centers around the use of “reciter” — essentially, a narrator — combined with a focus on two primary characters: a minor Samurai named Kayama Yesaemon and a sailor named John Manjiro. The remaining members of the ensemble played all the other characters. Chromolume’s seeming conceit and framing (by director James Esposito (FB)) was that this was a group of actors wandering in and presenting the story, which explained the small number and the use of men to play women (without having to go full on Kabuki, where that is the tradition). Reading some of the reviews before the show gave the impression this was more of a concert staging, but I never got that feeling. This seemed fully executed, albeit in the small. The performances developed by the actors and the director, James Esposito (FB), were strong. I remember watching the faces for the nuances of performance and find them. The stylized movements seemed appropriate, and the character interplay was good. The voices were strong — most notably Paul Wong (★FB; FB) [Reciter], Cesar Cipriano (FB) [Kayama Yesaemon], John Sala (FB) [Ensemble, Warrior, Russian Admiral, Sailor], and Gibran Mahmud (FB) [Ensemble, Fisherman, Dutch Admiral, Second Councilor, Sailor]. These four had voices that just blew me away (which is not to say that the others weren’t great either). The one whose face won me over was Julia May Wong (FB) [Ensemble, Tamate, Young Boy, Geisha Girl]. She just had great facial expressions in all of her scenes; she also wins the award for the best bio (a haiku: “About to Give up / Chromolume came to save her. / Honored. Humbled. Thanks.”). In the lead positions, as noted before, were Wong as Reciter, Cipriano as Yasemon, and Daryl Leonardo (FB) as John Manjiro. Wong was strong as the Reciter, carrying the burden of the exposition on his back, helping to explain the story to the audience. Cipriano and Leonardo had a good chemistry between them, same strong, and conveyed emotion well. Rounding out the cast, in addition to the three previously mentioned, were Marcel Licera (FB) [Ensemble, Lord Abe, Old Man, Sumo Wrestler], Peter Jeensalute (FB) [Ensemble, Mother, American Admiral, Merchant], Daniel Koh (FB) [Ensemble, Madam, British Admiral, Third Councilor], and Kevin Matsumoto (FB) [Ensemble, Commodore Perry, French, Admiral, Sailor]. Reuben Uy (FB) [Ensembleu/s, Madamu/s, British Admiralu/s, Third Counciloru/s] was the understudy. All were good: I particularly enjoyed the facial expressions in the “Welcome to Kanagawa” number, the difference characterizations in “Please Hello”, the Emperor puppet, and Matsumoto’s dance as Com. Perry. Uncredited in the program as the horse and the servant was the ASM, Louis Lake III (FB). Lake’s performance was a hoot and quite a surprise. Michael Marchak (FB)’s choreography seemed appropriately Japanese, but then again, I’m not an expert on the subject. All I know is that the movement worked well and was enjoyable to watch, and kept up with the various references thrown into the mix by Sondheim. Music was under the direction of Daniel Yokomizo (FB), who also led the on-stage but off-stage band on piano, assisted by (at our performance) John A. Graves [Bass] and Jeff Fish (FB) [Percussion]. Note: At some performances, bass is provided by Alex Moore (FB), and percussion by Anthony Jones (FB) or Lee Piatelli (FB). For its size, the orchestra was strong. Pacific Overtures is not a show that requires a large orchestra, as it isn’t dependent on traditional Western instruments as much as many shows. Turning to the production side of the staging. As you can see from the images to the right, Hector Figueroa (FB)’s scenic design was minimal: some platforms, tan and red backgrounds, and a hiding place for a character or two. Necessary context was provided by properties or the costumes, which were designed by Kara McLeod (FB). The costumes seemed reasonably appropriate; again, I’m not an expert on Japanese attire of tha period. Lighting design was by Jesse Baldridge (FB), and it worked well to establish the mood. There is no explicit credit for sound design, but James Esposito (FB) has done it for some past shows so it is likely he did it again. The sound worked well this time around. Veronica Vasquez (FB) was the stage manager, and the aforementioned Louis Lake III (FB) was the asst. stage manager… and the  :-). Publicity was by Ken Werther (FB). Pacific Overtures runs for one more weekend at Chromolume Theatre (FB), with performances today at 2pm and 7pm, and next Friday and Saturday at 8pm, and Sunday at 2pm and 7pm. Tickets are available through the Chromolume Website, discount tickets may be available through Goldstar. This really is a production you should see if you can: Pacific Overtures just isn’t produced all that often, and this may be one of the few chances you have to see a great production in an intimate space by a company that loves them some Sondheim. Chromolume Theatre (FB) has just announced their 2018 season, and it is three shows that I haven’t seen (in fact, two for which I didn’t even have the cast album until the announcement): Dessa Rose with book and lyrics by Lynn Ahrens and music by Stephen Flaherty [Feb 2 2018 – Feb 25 2018]; Jane Eyre – The Musical with music and lyrics by composer-lyricist Paul Gordon and a book by John Caird [Jul 13 2018 – Aug 5 2018], and Passion with music and lyrics by Stephen Sondheim and a book by James Lapine [Nov 9 2018 – Dec 2 2018]. We plan to subscribe in the next couple of weeks. You should too! Season subscriptions are only $60, which is $20 per show… and Goldstar is $18 per show plus service fees. What a bargain, and you help guarantee this little theatre’s survival. This afternoon brings the Colburn Orchestra at the Saroya (the venue formerly known as the Valley Performing Arts Center (VPAC)) (FB). I probably won’t write that one up. The weekend encompassing Chanukah sees us back at the Saroya (FB) for the Klezmatics (FB). We also hope to squeeze in a performance of A Christmas Story at the Canyon Theatre Guild (FB). We might also go to the 58th Annual L.A. County Holiday Celebration, as they are featuring Klezmer Music from 3-6pm on Dec 24, and we can take advantage of Metro to avoid the traffic. Of course there will also be the obligatory Christmas Day movie — who knows — perhaps it’ll be the upcoming The Greatest Showman. Afterward: The obligatory Chinese Food. February is busier. It starts with the Cantor’s Concert at Temple Ahavat Shalom (FB). The following weekend brings our first Actors Co-op (FB) production of 2018: A Walk in the Woods. Mid-week brings opera: specifically, Candide at LA Opera (FB). That is followed the next weekend by the first production of the Chromolume Theatre (FB) 2018 season, Dessa Rose. The month concludes with Dublin Irish Dance Stepping Out at the Saroya (the venue formerly known as the Valley Performing Arts Center (VPAC)) (FB). I monitor all sorts of theatre related feeds, one of which is the feed of Bruce Kimmel (FB). Kimmel was the guy (literally, the Guy) behind the Lost in Boston series, numerous theatrical record labels including his current Kritzerland, and one of my favorite Off-Broadway musicals, It Came From Planet X. We have seen many of Bruce’s shows — mostly at the LA City College Theatre Academy (FB) — and they have always been enjoyable. When Bruce indicated he was doing a Indiegogo to help mount an new Sherman Bros musical, I was intrigued. The Sherman Brothers — Richard M. and Robert B. (who died in 2012) — were the musical team behind many of the Disney musicals and music of the 60s and 70s. 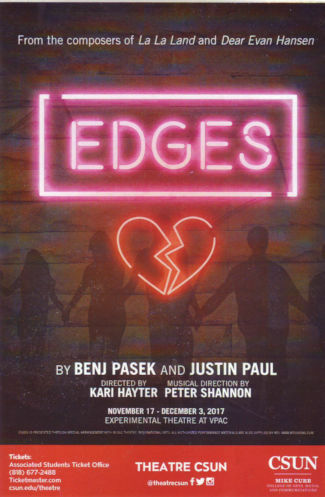 This musical had the potential to be very interesting, and so I signed up for the Indiegogo at a level that would get me tickets, and waited for it to be funded so I could schedule a date. That date turned out to be at a very busy time — as I was getting ready for ACSAC. Given that the show was dark for Thanksgiving weekend, there was only one possible date: the evening before we flew off to Orlando. So guess where we were Friday night, after packing all day? That’s right: we braved the traffic on the 118 and the 101 to get to LA CC for the penultimate performances of Levi! Levi!, which features a book by Larry Cohen (see also here) and Janelle Webb Cohen, purports to be a biomusical about Levi Strauss. It begins as Levi is coming to America with his friend, August. Levi makes it in but August does. Going to his family in New York, he starts life as a peddler in New York. Soon, gold is discovered in California, and his family sends him to San Francisco to represent the family business there. On the ship, he meets a fellow immigrant, Sarah Zimmerman, with whom he falls in loves. That hope gets destroyed when he learns that she is engages to Aaron Goodman. Levi arrives in San Francisco, losing the girl and most of his dry goods to businessmen who convinced him to sell it to them for 3x the value. All he is left with is worthless blue sailcloth canvas. That’s Act I. Act II continues the story with Levi going to the mining camp, and while saving some Chinese workers, discovering that the world — especially miners — need strong pants. A fellow miner comes up with the idea to rivet them, and the “Waist Overalls” are born. Soon Levi has factories all over, with his factory in San Francisco employing Chinese workers at the same wages as the white workers. This upsets the classed folk in San Francisco, and there are riots over the Chinese Exclusion Act. Meanwhile, one of the Chinese girls has fallen in love with Levi, but he doesn’t follow up on it. The riots force Levi to send his Chinese workers to Chicago. He never gets the girl, although at the end of the show he does bring over August’s family, whom it is implied will succeed him at the factory. Note: After this write up was posted, the producer, Bruce Kimmel (FB), commented with some corrections to what I wrote. I have interpolated his comments in this style. Additional thoughts, if any, follow his comments. We walked out of the show thinking it had a lot of promise. It did what a good bio-show should do: It made me want to research the person around whom the story was constructed. It had a great musical and singing, and strong performances. But work was needed. The Chinese immigrant portions of the story had aspects that could be viewed as cultural insensitivity, especially as they were written by non-Chinese folks. A good Asian dramaturg was needed to ensure those aspects were handed with the right sensitivity and accuracy. While I understand what Bruce is saying — and I do agree that we shouldn’t always look at things through the lens of today’s sensitivities — I do think there will be some who will be bothered by this. I hope that isn’t the case, but fear it may be. I still remember many years ago by people being upset at the phrase “Chinese Fire Drill” in reference to the production of Heartbeats at the Pasadena Playhouse, and I have a number of friends that are oversensitive to cultural appropriation and such. All shows can use improvement, so this may be one area to tweak as the production matures. The issue is not changing history; the issue is adjusting the presentation to not fall into stereotypes or problematic tropes, and to ensure it is accepted by all audiences and doesn’t serve to distract them from the rest of the show. Some songs were clearly Disney-style; “Opportunity!” could fit into the Carousel of Progress any day. The show was saddled with what I call the Mack and Mabel problem: you want the hero of the story to get their dream family and career, but that is dashed on the rocks of reality. Same problem here: Strauss never got the wife and family he wanted. How do you make that ending upbeat. All of these are book problems — and were probably one reason why after the initial readings of the show many many years ago, it was shelved. But they can be worked out — they were not insurmountable. I’m glad to learn that wasn’t the reason the show wasn’t initially produced. I did like the book of the show and the characters (and I felt the same way about Mack and Mabel when I saw it at the LACLO); it’s just that the ending you hope for doesn’t materialize. That was handled the best way it could in this book, but it still leaves a twinge of disappointment. I do think audiences today can handle that better — which is why I didn’t believe that to be insurmountable. Alas, when I got home, I discovered there may be an insurmountable problem that will prevent this story from going on. It certainly soured me on the story aspect (not the performances or the music, mind you). It is a problem I lay solely at the feed of the book writers, one of whom may have had a political agenda. Simply put: The story itself is 98% fabrication. Based on my research (also here, here, here, here, here, and here) the only true aspects were Strauss immigrating from Bavaria, landing in New York, eventually going west, selling “Waist Overalls”, and never marrying. There is no evidence of a friend named August who tried to come over with Strauss; he actually immigrated with his mother and sisters. Strauss went to Louisville KY to sell dry goods after New York before being sent to San Francisco. Already in San Francisco was his sister Fanny, who moved there from St. Louis. There was no Sarah Zimmerman, nor did her husband Aaron Goodman exist and go on to the US Senate. Levi didn’t invent the Waist Overalls in the gold mining camps, nor did the idea for the rivets come from a fellow miner. Rather, Strauss was already making the pants, and one of his merchandisers, Jacob Davis, came up with the idea for the rivets and sent it to Strauss, and the two patented the idea. There is no evidence of the Chinese workers that I could find, other than Levi Strauss and Company getting into hot water for mistreatment of Chinese workers in the 90s — and that’s the 1990s, not the 1890s of this story. Strauss ends up not leaving the country to August’s kids, but to the family of his sister Fanny. Further, it appears that in order to obtain any historical photos from the company, they have to vet the story and authorize that it is correct. As I noted when I first wrote this up: It did what a good bio-show should do: It made me want to research the person around whom the story was constructed. That’s where I discovered the portions of the story that were fabricated, and that’s where I couldn’t find articles on the internet that corroborated what I really, really, wanted to be true — because the story they put on stage was such a good story. Perhaps this could be handled best by managing expectation: Providing something in future programs (1 page) that acknowledges some changes were made in the story for stage purposes, and perhaps even identifying them and acknowledging the reality. Seeing the reviews saving the new movie The Greatest Showman for not presenting the bad slides of the life of P. T. Barnum, while the story seemingly told had as much hiding of reality as Cy Coleman’s musical Barnum did, demonstrates that today some segments want no historical whitewash. I recall similar problems after Finding Neverland. So you acknowledge the differences, and move on. So that uplifting book? A fabrication, and one that the Levi Strauss company would likely get upset about would this make it to Broadway. The book, in this form, is DOA. That does’t mean the songs — or at least most of them — couldn’t be salvaged into a realistic story. Some new songs would have to be written, and with half of the musical writing team deceased, that might be difficult. Kimmel could partnership with Richard to complete and rework the songs — he shares writing credits on one song in the show already. But a lot of rework is required to get this show to a Broadway-ready form. Update: After reading Bruce’s comments, the above paragraph is too harsh. I still think some tweaking might be required as this moves along its life-path… but I no long believe it is DOA in its current form, or that a significant amount of rework is required. Which is sad, in many ways, because there is so much potential here. The opening number of the show, and the main theme of the show — Opportunity! The Streets are Paved with Gold — captures the immigrant Jewish experience quite well. It captures the promise and the reality. A few other shows have touched upon this — Rags and Ragtime most notably — but it is a great subject to tackle. The story of Strauss’ start in the west is a good one, minus the unnecessary Chinese subplot. But any bio-story needs to be historically correct (or at least 80%), and there just may not be the right protagonist for this story to make it survive for the two acts and all the songs it needs to motivate. I do to. I hope the show goes on to a long life — I saw loads of potential in it. Reading Bruce’s comments and responses makes it clear the show may not have all the problems I saw — and that’s a good thing. But if there is one thing I’ve learned, is that if one audience member sees something someway, others will see it that way — even if that wasn’t the producer’s intent, and even if others in the audience don’t have the same reaction. As in the acquisition world in which I work, the program office (that is, the producer), must decide the level of risk that is acceptable to them, and may choose to mitigate that risk. This was the first production of a show, and for a first production, it was 90% there if not more (and much better than many other first productions I’ve seen and still wish would reappear in a final form — I still remember Les Jazz at the Taper, and Mask and Dangerous Visions at the Pasadena Playhouse, as examples). But if I saw something — even if I interpreted it wrong — then others may as well. If small tweaks can address those issues — either through book or presentation changes — to make the show even stronger, as with software, earlier is the time to do them. If one reads histories on musicals — especially musicals that might eventually make, shall we say, “The Big Time” — is that they grow and adjust from production to production along the way. They aren’t frozen at the beginning. My intent — as I do in my real world job — is to identify potential risk. It is the job of others to determine the likelihood of that risk, and make any necessary mitigations. As for the songs themselves: they are (for the most part) enjoyable and peppy, and classic Sherman Brothers songs. This show needs a cast album to preserve the music and these performances. Kimmel has the ability to do so and has done so in the past, and even given my problems with the book, I’d participate in an Indiegogo for that album. Some of the songs are great — especially the opening number and the repeated theme, the “Business is Business” number, the “Pay Dirt” number and its audio choreography. Even the touching ballad that Kimmel helped complete, “So many Empty Rooms”, is really good. A few songs are on the culturally problematic side — “Like a Man” has that problem (as well as the comparisons to Mulan), or “Great American Friend” or “Dream I Must Not Dream”. Absent those songs, the ones here are great (although perhaps a tad too Disney — and I’m writing this walking distance from Disney Orlando, so I know). The one other concern I had song-wise was whether this show was too much in the “old-style” musical style of musicals from the 1960s and 1970s. Broadway musicals have seen a seismic shift in how the songs connect with the material (think Hamilton or Dear Even Hansen), and the style here just feels barely old-school. I’d agree, to an extent, although Hello Dolly, South Pacific, and King and I also were classic era successes to begin with, not new shows. Other new shows that have had the old-fashioned feel haven’t had the same success — even though I might personally have loved the music and the books (Young Frankenstein, Addams Family, and Big Fish are examples here, although they’ve had a long production lives after Broadway). Others, luckily, have hit with the audience in spite of being old fashioned in construction and having slight book problems as perceived by reviewers (Wicked is an example here). So I think the concern remains. The show will be a hit for the audience looking for an old-style show. The plot elements may allow it to connect with the audiences looking for meaning, but will that be enough to overcome the older musical stylings — that’s the question I can’t answer. PS: If you want to hear the music from this, Bruce’s label, Kritzerland, is doing a limited run pressing of the cast album. I encourage you to order and give it a listen. So, summarizing what we have so far: Book and Music-wise, this show has lots of promise and many wonderful songs. However, there are some structural and content problems at the heart that would require significant rework [Edited: could use a little tweaking] if this show was to succeed about this this subject, in these days, in a larger venue and lifespan (i.e., a Broadway mounting). So, setting book aside, how was the execution of the show. Here I’m pleased to say that it was top-notch; something I’ve come to expect and enjoy when Bruce Kimmel (FB) is at the helm as director and Kay Cole is on-board as Choreographer. This team works well together, and takes the time and care to bring out great performances from the actors. In this case, most of the actors were students at LACC, but you would never know it from the quality of their performances. The choreography was also great — especially in the “Pay Dirt” number. The show was simply enjoyable to watch owning to the hard work of the actors and the directorial and choreographic teams. The actors were having the time of their life on the stage, and it was reflected and amplified by the audience. So kudos to the team for this. In the lead position was Marc Ginsberg (FB), the sole Equity actor, as Levi Strauss. He was a delight to watch. He had a singing voice that I really enjoyed (particularly in the opening number, “Seven Beautiful Children”, and “Look How It Adds Up”), a great stage presence, a personality that came through in his performance, and just an affable way of relating to the other actors that made the show great. If the show were still running, I’d advise you to go see it just to see his remarkable performance. Most of the rest of the performers were either students in the LACC Theatre Academy, or alumni of the Theatre Academy. The quality of their performances were remarkable. There are a few sets of named performers, and then I’ll get to the ensemble players. As Sarah Zimmerman, Rachel Frost (FB) had most of her scenes on the boat between New York and San Francisco, with a few more in San Francisco. She interacted well with Ginsberg’s Strauss, and had some beautiful numbers in “We Know Why”, “Happy Love”, and”So Many Empty Rooms”. She had a lovely singing voice. The two young kids — Scotty Vibe (FB) [Jacob] and Hadley Belle Miller (FB) [Young Girl] were… cute. But I also noted their performances, and how they played with their characters even when it was clear they were on-stage primarily for the “ahh, cute” factors. They were acting, and they were doing a great job of it. The Chinese contingent — Tristen Kim (FB) [Han Chow], and his three “wards” Prisca Kim (FB) [Su Lin]; Eliza Kim (FB) [Tim Sang]; and Brianna Saranchock (FB) [Tam Lee, Immigrant, Woman, Miner] — were interesting to watch. Problematic characters in a cultural-sensitivity sense, they had good comic timing in “Like a Man” and the surrounding scene, and Prisca Kim did a delightful job with her solo “The Dream I Must Not Dream”. Note that I was also taken by her performance in Kimmel’s previous LA: Then and Now. The problem with these characters is how to integrate the performance without having it drop into the stereotypical or formulaic. Jesse Trout (FB) [Howard, Miner, Official] and Connor Clark Pascale (FB) [Stafford] are perhaps the villains of the piece: they underpay Strauss on the boat, and later they to convince him to go against his Chinese workers. They capture the villainy right, and do good on their reprise of “Business is Business”. Rounding out the cast in various ensemble and smaller named roles were: Charlton Brio (FB) [Old Willie, Miner, Immigrant]; Kyle Brogmus (FB) [Official, Junk-Man, Sailor, Crew-member, Miner]; Eugene Thomas Erlikh (FB) [Karl, Stevedore, Voice 1, Immigrant]; Paola Fregoso (FB) [Streetwalker, Flo]; Bedjou Jean (FB) [Blacksmith, Official, Miner]; Kole King (FB) [August, Isadore, Shortman]; Christina McGrath (FB) [Official, Peddler, Miner]; Shawna Merkley (FB) [Crew, Woman, Voice 3]; Anastasia Perevozova (FB) [Aunt Frieda, Immigrant]; Justice Quinn (FB) [Miner, Voice 2, Official]; Savannah Rutledge (FB) [Official, Peddler, Servant, Miner]; James Singleton (FB) [Goodman, Immigrant, Policeman, Cowboy, Miner]; Trenton Tabak (FB) [Man 1, Man 2, Passerby, Official, Miner]; and Sabrina Torres (FB) [Immigrant, Miner]. As a group, they sang and moved well; they also seemed to be having fun with their roles. The production was under the Music Direction of Richard Allen (FB), and featured Orchestrations by Lanny Meyers (FB). The on-stage, in the back, orchestra consisted of Richard Allen (FB) [Keyboard1, Conductor]; Lanny Meyers (FB) [Keyboard2]; Say Jay Hynes [Violin]; Kim Richmond and John Reilly (FB) [Woodwinds]; Timothy Emmons [Bass]; and Ed Smith (FB) [Drums / Percussion]. The orchestra sounded great. Rounding out the production credits: Tesshi Nakagawa (FB)’s scenic design was a movable wood structure that made me think of Hamilton‘s scaffolding. Minimalist, but it worked well. The lighting design by Derek Jones (FB) set the mood well. The Sound design by Austin Quan (FB) was reasonably clear, although there were a few mic problems. Morgan Gannes (FB)’s Costume Design seemed appropriately period. Graphic design was by Doug Haverty (FB). Maggie Marx (FB) was the Production Stage Manager. 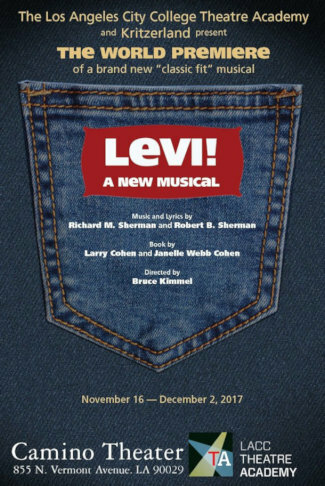 The last performance of Levi!i was Saturday, December 2, 2017. However, sometimes first attempts are great. Witness the show now at the Ahmanson Theatre (FB). It is from two new writers for Broadway, Karey Kirkpatrick (FB) and John O’Farrell (although both have extensive writing experience). It is from a first-time Broadway song-writing team, brothers Wayne Kirkpatrick (FB) and the aforementioned Karey Kirkpatrick (FB) — although both have extensive experience on the pop music side. Lastly, it is based on a new (i.e., first-time) idea from those brothers. This could have had the makings of a total disaster. After all, two brothers, writing a show for a medium they’ve never worked in, with a totally new idea. What could go wrong? Hold that idea for the synopsis. And that, friends, it the plot of Something Rotten. Can I go home now? I feel like I’ve done this before. OK, so that’s not all their is to Something Rotten. There is also a lot of satire of shows that have been previously on Broadway. This creates an interesting coincidence. Last week, we saw another show that poked fun at Broadway shows, Spamilton. Two consecutive shows that have a common thematic element. That also happened the last time we were at the Ahmanson: Both Bright Star and Mice! share a common thematic elements. The third time, however, won’t be the charm. I’m at a loss to think of a single common thematic element between Soft Power and either School of Rock or Violet. But who knows…. So what is the story of Something Rotten? Imagine it is the Renaissance — you know, what you see at your local RenFaire. Shakespeare is at the top of his game and is the equivalent of a rock star. The rest of the writers in town? Well, they’re just a renfaire show compared to him. But two brothers continue to try to best him: Nick and Nigel Bottom. Shakespeare once was a part of their troupe, until they fired him for having no talent as an actor — they told him to try writing. A big mistake. Since then, he’s been rising and they are having trouble paying the bills (as his wife Bea, who will do anything to help him, continues to remind him). Nick is the outward face and the main writer; Nigel is a poet at heart. Knowing they must find the next big thing to beat Shakespeare, Nick visits a soothsayer. The prediction: Musicals. At this point, Nick decides to write a musical, using Nigel’s lyric sonnets as lyrics. They start with a first attempt, but their topic just doesn’t sell — a musical about the Black Plague. Nick decides he just needs to know what Shakespeare’s next big hit will be? He visits the soothsayer again, and the answer is: Well, it looks like something called Omlette. There are also visions of Ham and Danish, along with snippets of plots and loads of other musical ideas. So off Nick goes to write a musical about breakfast foods. He even allows the Jewish financier, Shylock, to invest. Complicating the plot are the Puritans. They really know how to destroy the mood. In this case, the daughter of Brother Jeremiah, Portia, has fallen in love with Nigel’s poems — and thus with Nigel. But Nigel is a man of the theatre, where men dressed as women kiss other men, and they are bringing in song and dance. He forbids the relationship, and we all know what happens with forbidden relationships in Elizabethan times. I think you can take it from there. The humor in this show is very broad, and there are loads of sexual jokes and double entendres. If you’ve ever been at a renfaire, you know that fits right in. There are loads of references to other Broadway shows, either by word or sight gag. If those are your tastes in humor, you will love this. They are, and I did. I found this an extremely funny show — perhaps not as funny as Spamilton, but very very close. I also enjoyed the music quite a bit. Ever since the Tony Awards showcased “A Musical”, I’ve loved that song, and other songs such as “Right Hand Man”, “Welcome to the Renaissance”, and “Make an Omlette” are equal earworms. So this show had broad humor and great music. It’s not very deep, but when you go to see a musical, who wants to see something dark and dreary. Well, except for Les Miserables. Director and choreographer Casey Nicholaw understands broad humor, given his background with Drowsy Chaperone, Book of Mormon, and Spamalot. He works with the performance team to bring the humor out to the audience, playing it broad and including the timing for the laughs. He fills the dances with energy as if they were something new, and cleverly plays with and on the conventions being parodied. It works well and is quite enjoyable. So should you see this for the story? Yes, you’ll have lots of fun, and find it well worth the price (which will be substantially less than you’ll pay for that show on Hollywood Boulevard — and that’s no joke). But the story isn’t all — there are great performances in addition. In the top positions are Rob McClure (FB) as Nick Bottom and Josh Grisetti (FB) as Nigel Bottom. McClure’s Nick is in many senses a classic straight man — he isn’t in on the joke of what is going on around him, and in that, he’s hilarous. He plays that aspects quite well, which combined with strong singing and dancing make him a joy to watch. I’ve heard him before but never quite connected the voice to the performance (in both Honeymoon in Vegas and Chaplin), and I’ve likely seen him in the Avenue Q tour, but his performance here makes me want to follow his career a bit more. Just watch him in numbers like “God, I Hate Shakespeare”, “A Musical”, “Bottom’s Gonna Be On Top” or “Make an Omlette”. He also has great chemistry with his on-stage wife, Bea (Maggie Lakis (FB)), which comes across wonderfully during their shared “Right Hand Man”. This shouldn’t be a surprise, as his on-stage wife is his off-stage wife of 12 years — they met in the cast of Grease. That certainly must make touring easier. I haven’t forgotten about Nick’s on-stage brother, Nigel. Of the two, Nigel is more the poet of the two, and has less of the physical and dance humor. He does get a cute girl, tho…. Grisetti handles NIgel’s character well, capturing the poetic side of him and the adultation of Shakespeare (which his brother hates). He also has a very nice singing voice which is shown in his numbers with his love interest, Portia, played by Autumn Hurlbert (FB): “I Love the Way” and “We See the Light”. He also demonstrates it in his number “To Thine Own Self”. Of course, how can we forget the rock star bard, Will Shakespeare, played by Adam Pascal (FB). Pascal captures the character well, perhaps from his actual rock star experience, both from his lead roles in both Rent and Aida, as well as his rock credentials. It is clear he is having fun with this role and is conveying that to the audience. Watch him in “Will Power” and “Hard to Be The Bard” and you’ll see what I mean. Moving to the remainder of the named characters, the next two main ones are Nostradamus, played by Blake Hammond (FB), and Shylock, played by Jeff Brooks (FB). Hammond’s Nostradamus is a hoot, from the first time we see him just before “A Musical”. He sings well, dances well, and most importantly, plays the humor well while having a load of fun. Just a joy to watch. I also enjoyed Brooks’ Shylock. A much smaller role, but I have to love a MOT in a role that highlights what it was like for Jews during those times (something conveniently omitted from your local RenFaire). He does great in “To Thine Own Self”. The remaining named role is Scott Cote (FB)’s Brother Jeremiah, head of the Puritans and father of the aforementioned Portia. Cote gets some of the best double entendre lines in the show, and he says them with a great straight face and the occasional double-take. He is also great in the “We See The Light” number. This then brings us to the ensemble and the smaller named roles. Two things I would like to highlight about the ensemble: (1) Nick Rashad Burroughs (FB) [Minstrel, Snug, Chef Trio] was wonderful as the MInstrel who opens each acts; (2) the ensemble seemed to be having loads of fun with this show. I watch a show both with and without binoculars, and it was fun just watching the faces of the ensemble as they were performing and just having fun. That fun is infectious and carries to the audience. The ensemble, in addition to Burroughs, consisted of (additional named roles and understudy (u/s) noted): Lucy Anders (FB) [Portiau/s]; Kyle Nicholas Anderson (FB) [Tom Snout, Chef Trio, Nigel Bottomu/s]; Daniel Beeman (FB) [Yorick, Shakespeare’s Valet, Will Power Backup Boy, Shakespeareu/s]; Mandie Black (FB) [Asst. Dance Captain]; Pierce Cassedy (FB) [Robin, Nigel Bottomu/s]; Drew Franklin [Will Power Backup Boy]; Ralph Meitzler (FB) [Will Power Backup Boy, Shakespeareu/s]; Patrick John Moran (FB) [Francis Flute, Master of the Justice, Nostradamusu/s, Brother Jeremiahu/s, Shylocku/s]; Joel Newsome (FB) [Lord Clapham, Eyepatch Man, Nostradamusu/s, Brother Jeremiahu/s, Shylocku/s]; Con O’Shea-Creal (FB) [Peter Quince, Will Power Backup Boy, Chef Trio, Nick Bottomu/s]; Kaylin Seckel (FB) [Beau/s]; Sarah Quinn Taylor (FB); Tonya Thompson (FB); and Emily Trumble (FB) [Beau/s]. The following folks were in the cast as backup swings: Kate Bailey (FB) [Portiau/s]; Brandon Bieber (FB) [Dance Captain]; Ian Campayno (FB); and Cameron Hobbs (FB). I’ll note there’s a clear reason Bieber is the dance captain — he’s got loads of asst. choreographer credits under his belt. Turning to the music, without which the songs and the dances would …. look funny. Brian P. Kennedy (FB) was the Music Director and Conductor, with Music Supervision and Vocal Arrangements by Phil Reno, music arrangements by Glen Kelley, orchestrations by Larry Hochman (FB), and music coordination by John Miller (FB). The orchestra consisted of: Brian P. Kennedy (FB) [Conductor / Keyboard1]; William Shaffer [Assoc. Conductor / Keyboard2]; Cameron Rasmussen (FB) [Guitar1]; Brad Flickinger [Drums / Percussion], Sal Lozano [Reed1]; Rob Schaer [Trumpet]; Robert Payne [Trombone / Contractor]; Jen Choi Fischer (FB) [Violin]; Justin Lees-Smith (FB) [Guitar2]; Alby Potts (FB) [Keyboard3]; Ken Wild (FB) [Bass]; John Sawolski (FB) [Keyboard2 Sub]. Music Copying was by Emily Grishman, who was joined by Katharine Edmonds for Music Preparation. Finally, turning to the production and creative team. The scenic design was by Scott Pask, who creates a reasonably flexable approach using backdrops and lighting; it looked flexible enough to allow this to be easily adapted for the high-school and regional crowd — ensuring a long life. The sound and lighting design was by Peter Hylenski (FB) [Sound] and Jeff Croiter (FB) [Lighting]. Costume Design was by Gregg Barnes (FB), who created a look that was a bit fancier than RenFaire, but probably fit what people were expecting. Josh Marquette (FB)’s Hair Design was great at the design level, but there was an execution problem — with the binoculars, the hair-net of the wig was a clearly visible line on the forehead, and that’s not great for suspension of disbelief. Rounding out the production credits were: Jeff Norman [Production Stage Manager]; Matt Schreiber [Stage Manager]; Brae Singleton (FB) [Asst. Stage Manager]; Steve Bebout (FB) [Assoc. Director]; Eric Giancola (FB) [Assoc. Choreographer]; Telsey + Company (FB) [Casting]; Jim Harrison [Company Manager]; Port City Technical (FB) [Production Management]. 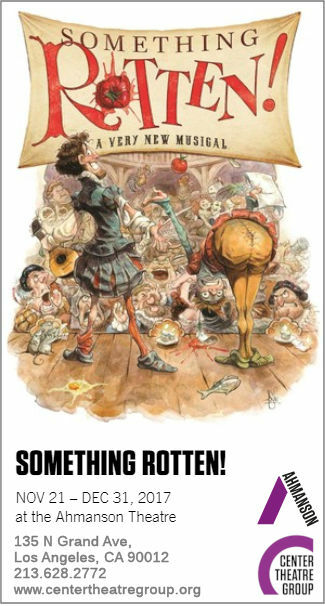 Something Rotten continues at the Ahmanson Theatre (FB) through December 31. Tickets are available through the CTG Website; discount tickets may be available through Goldstar. The show has broad humor, great singing, great dancing, and loads of references to other shows. Who could ask for anything more … oh, right, never mind that line. Still, it is a wonderful show and you’ll have a great time. But don’t leave just yet. Twice a year Broadway turns to us, its captive audience, to demand ransom (uh) request our support for Broadway Cares / Equity Fights AIDS (FB), an organization that — all joking aside — does some remarkable work. We go to enough theatre that we always seem to catch the BCEFA appeal, and we always give something. You should too, by clicking here. Alas, no one donated enough at our performance so that this happened. While this season is troubled for the Ahmanson with the postponement of the next show, the next season is looking great. In addition to the previously announced  Dear Evan Hansen, CTG has announced three more shows:  Falsettos,  Come From Away, and  The Play That Goes Wrong. Depending on what the last two shows are, this might entice me to subscribe. November concludes with the Anat Cohen Tentet at the Saroya (the venue formerly known as the Valley Performing Arts Center (VPAC)) (FB) and Levi (a new Sherman Brothers musical) at LA Community College Caminito Theatre (FB). Most musicals start with a simple premise, idea, or property. I’m sure your familiar with this. A musical swinder. A gang fight, A matchmaker. Breakfast foods. You get the idea. The show we saw last night at the Ahmanson Theatre (FB), Something Rotten, was such a show. The premise? What if Shakespeare had been the stuck-up rock star of his generation? The rest of the theme then follows quickly: What about the other “rock stars” of that era — the other writers? How did they get visibility when outshone by Shakespeare’s sun? How would they achieve the level of fame and fortune? Add in a bit of referential humor, and you basically have the plot of Something Rotten. That referential humor, by the way, creates quite a interesting coincidence. When we were last at the Ahmanson back in October, we saw the musical Bright Star. The next day I saw a play that had echoes of the same thing – Mice. Last week, we saw Spamilton at the Kirk Douglas. It was a musical that was chock full of references to other musicals in addition to their main target of parody. Last night’s Something Rotten? Same thing. Most of the sequences involving the soothsayer were filled with references to other musicals, starting with “A Musical” (which you might remember from the Tony Broadcast) and exploding in the “Make an Omlette” scene. So, both recent visits to the Ahmanson have been sequential with related shows. That trend probably won’t last: Soft Power is sandwiched between School of Rock and Violet. As I alluded too earlier, the plot of Something Rotten revolves around Shakespeare. Specifically, it is the story of the Bottom Brothers, Nick and Nigel, who are competing playwrights to Shakespeare. He used to be part of their acting troupe, but was fired because he was a bad actor (and he was told to become a writer). Shakespeare’s star keeps rising, and the Bottom Brothers keep failing. In an attempt to find the next big thing, Nick Bottom consults a soothsayer who says it will be … Musicals. Nick is eventually convinced and starts writing, using his brother’s poetry as lyrics. But the subjects just don’t work out, and so he visits the soothsayer again to learn what Shakespeare’s next big hit will be? The answer? Omlette, and perhaps something to do with Ham and Danish. Nick starts running and won’t be deterred, even when his brother falls in love with a Puritan’s daughter, and writes perhaps the best play he’s ever written. You can guess a bit as to what happens then: Shakespeare steals the good play and Omlette fails … and we deal with the aftermath. What? You didn’t want that spoiler? Well, Romeo and Julia both die as well. Along the way, we meet some various other characters: Bea, Nick Bottom’s long suffering wife that just wants to help him succeed in any way she can; Portia, the aforementioned Puritan’s daughter who falls in love with Nigel’s words; Shylock, the Jewish financier who just wants to be a producer (answering the question of why you see so few Jewish folks at RenFaire); and the Puritans headed by Brother Jeremiah, who believe that theatre is a sin — especially those men dressed as women kissing men — and that music in theatre is just heresy and an abomination. Puritans really know how to screw up anything that’s fun. Give them an inch, and next thing you know, they’ll screw up the ideals of that new world we just discovered. In general, the show is a delightful silly romp — made even more fun by all the interpolated show references. First time theatre writers Karey Kirkpatrick (FB) and John O’Farrell have crafted a hilarious story that allows you to forget the cares and troubles of the outside world for two and a half hours, and that’s sorely needed now. Kirkpatrick (FB) and his brother Wayne (FB, ★FB) — first time Broadway musical writers — also crafted some fun music for the show with some songs that have rapidly become favorites — in particular, “A Musical”, “Right Hand Man”, and the opener “Welcome to the Renaissance”. Director and Choreographer Casey Nicholaw then infused the stage expression with energy and the right level of self-referential camp to make it all work. That’s two stellar CTG shows in a row. It also helps that the performances are great as well. In the top position — sorry, Will — are Rob McClure (FB) as Nick Bottom and Josh Grisetti (FB) as Nigel Bottom. Rob McClure is someone I never realized I liked as much as I do. Perhaps I should explain. I’m actually a fan of the music of Jason Robert Brown’s Honeymoon in Vegas, which flopped on Broadway but starred McClure. I also enjoyed listening to McClure’s work in Chaplin. But I had never seen him in person. Not only did he sing well, but he handled the humor and dance well, making this an enjoyable production. He also has great chemistry with his on-stage wife Bea, played by his wife-in-real-life, Maggie Lakis (FB). This real-life chemistry adds to the stage chemistry in songs such as “Right Hand Man”, which they both nail. But even in other numbers, such as my fav “A Musical” or “I Hat Shakespeare” or “Make an Omelette”, he is just spectacular. Turning back to Grisetti’s Nigel Bottom: This is the less comic, more romantic character who is the poet, who handles the humor, singing, dancing, and performance very well. He is also quite strong, especially in his scenes with his love interest, Portia, played by his not-wife-in-real-life Autumn Hurlbert (FB). The duet with the two in “I Love the Way” and “We See The Light” is just great, but Grisetti does well by himself in “To Thine Own Self” (and the scene surrounding it). Then there’s Shakespeare. What more be said. But seriously, Adam Pascal (★FB)’s portrayal of the bard has the right rock-star edge in it because Pascal has experience playing rock-star like characters from both Rent and Aida. He has experience with the rock style of music, and handles both the music and the swagger well. P.S. : This was a BCEFA weekend, and evidently two nights ago someone donated $1K, resulting in this. I’ve already touched upon the two major second tier characters — the love interests Bea and Portia. Both gave wonderful performances, and I’ve already mentioned their singing. Alas, this show was not written with large roles for women that would showcase them even more. Also standing out on this tier were Blake Hammond (FB)’s Nostradamus and Jeff Brooks (FB)’s Shylock. We first see Hammond in the showstopper “A Musical” where he leads the action, and then he reappears in songs like “Bottom’s Gonna Be On Top” and “To Thine Own Self”. He handles not only the singing and the dancing, but the comedy side of the performance as well, as is just fun to watch. Brooks’ Shylock has a smaller role, but the nature of the character and the point that he is making appeals to me. The last significant named character is Scott Cote (FB)’s Brother Jeremiah, who plays Portia’s Puritan father. A fun performance, especially in his comic interactions (not sung, but — for example — at the end of the Black Death scene) and in “We See the Light”. Rounding out the on-stage cast were the members of the ensemble. It is harder to single out performances here, as the audience does not have an easy way of putting names with faces. I would, however, like to highlight Nick Rashad Burroughs (FB), who opens the show and Act II as the Minstrel, and who has a remarkable singing voice. In general, the ensemble does a fantastic job. I enjoy occasionally pulling out the binoculars and watching the faces of the ensemble, and these folks were clearly having a lot of fun, and that comes across to the audience. The ensemble consisted of the following folks (additional roles beyond the ensemble are noted): Lucy Anders (FB) [u/s Portia]; Kyle Nicholas Anderson (FB) [u/s Nigel Bottom]; Daniel Beeman (FB) [u/s Shakespeare]; Mandie Black (FB) [Asst. Dance Captain]; Pierce Cassedy (FB) [u/s Nigel Bottom]; Drew Franklin; Ralph Meitzler (FB) [u/s Shakespeare]; Patrick John Moran (FB) [u/s Nostradamus]; Joel Newsome (FB) [Lord Clapham; U/s Nostradamus, Brother Jeremiah, Shylock]; Con O’Shea-Creal (FB) [u/s Nick Bottom]; Kaylin Seckel (FB) [u/s Bea]; Sarah Quinn Taylor (FB); Tonya Thompson (FB) and Emily Trumble (FB) [u/s Bea]. The Off-stage cast (i.e., swings) were: Kate Bailey (FB) [u/s Portia]; Brandon Bieber (FB) [Dance Captain]; Ian Campayno (FB); and Cameron Hobbs (FB). Looking up the websites for this writeup, I can see why Bieber was Dance Captain — he has a hella lot of Assistant Choreographer experiences. My periodic note to actors regarding my searching for their websites: I encourage you to get yourself websites — this provides a good stable place to put your credits and contact information. If you have such a site, remember to pay the domain name fees and keep it current. If you don’t have a site, the next best are sites like www.abouttheartists.com, Backstage, and other of those ilk with your resume. My last link of choice is Broadway World, Broadway.Com, or Playbill, because those only list Broadway credits, not the regional stuff you’ve been in. Turning to the music side of things: Larry Hochman (FB) did the Orchestrations, with Music Arrangement by Glen Kelly (FB). John Miller (FB) was the Music Coordinator. The orchestra was conducted by Brian P. Kennedy (FB), who also was first Keyboard. Others in the orchestra were: William Shaffer (FB) [Associate Conductor; 2nd Keyboard]; Cameron Rasmussen (FB) [Guitar]; Brad Flickinger [Drums/Percussion]; Sal Lozano [1st Reed]; Rob Schear [Trumpet]; Robert Payne [Trombone, Contractor]; Jen Choi Fischer [Violin]; Justin Lees-Smith (FB) [2nd Guitar]; Alby Potts (FB) [3rd Keyboard]; Ken Wild (FB) [Bass]; John Sawolski (FB) [2nd Keyboard Sub]. Emily Grishman did the music copying, and was joined by Katharine Edmonds in doing the music preparation. Phil Reno was the music supervisor and did the vocal arrangements. Finally, we come to the remaining production and creative credits. The scenic design was by Scott Pask, and worked reasonably well. In particular, I noted that it is something that might be doable by high schools, so this show might have a good long life. The sound design was by Peter Hylenski (FB), with Jeff Croiter (FB) doing the lighting design. Both did what they were suppose to do: create the mood clearly, while otherwise being unobtrusive. Gregg Barnes (FB) did the Costume Design, and Josh Marquette (FB) did the hair design. The costumes worked well, although they seemed a bit more stereotypical than the costumes I see at the RenFaire, so someone’s got their history wrong. The hair — specifically the wigs — were more problematic. Note the quality of the hair itself, but watching the show with binoculars I was clearly able to see the net wig lines on foreheads — and that hurt the illusion. The fact that it is a wig must be invisible. Other production credits: Jeff Norman (FB) – Production Stage Manager, Matt Schreiber (FB) – Stage Manager, Brae Singleton (FB) – Assistant Stage Manager; Steve Bebout (FB) – Associate Director; Eric Giancola (FB) – Associate Choreographer; Telsey + Company (FB) – Casting; Jim Harrison (FB) – Company Manager; Port City Technical (FB) – Production Management. Twice a year, the Broadway community raises funds for Broadway Cares/Equity Fights AIDS. We always seem to catch one of these fund raising performances, and this weekend was no exception. We donated. Now it’s your turn. Something Rotten continues at the Ahmanson through December 31. You can get tickets through the Ahmanson Website. Discount tickets may be available on Goldstar. This is a very funny and entertaining show; go see it. The Ahmanson Theatre (FB) has announcement more of its 2018-2019 Season. In addition to the previously announced  Dear Even Hansen, the Ahmanson has announced three more shows:  Come From Away;  Falsettos; and  The Play That Goes Wrong. This is shaping up as a season worthy of subscription — I just need to learn what the remaining two shows are. Knowing the Ahmanson, one will likely be a pre-Broadway musical. First and foremost, my apologies in the delay in posting this. I’ve just been slammed this week in the evenings, combined with a migraine cycle. Shortly after the Hollywood Pantages (FB) announced that it was bringing in the Hamilton juggernaut, the Center Theatre Group (FB) was faced with a dillemma: how to counterprogram? Their answer was to jump on the bandwagon with Spamilton. Spamilton is a parody musical that sprung from the creative mind of Gerard Alessandrini (FB), creator of the long running spoof series, Forbidden Broadway. The Forbidden series has been long known to skewer current and past Broadway shows, and Spamilton could well have been titled Forbidden Hamilton — for that’s what it is: taking all of the hot air out of the musical theatre over-inflated Hamilton while simultaneously showing its love for the show. Along the way, it skewers other present and past Broadway shows. Miraculously, I had not had the opportunity to obtain the Spamilton cast album before the show, and I hadn’t heard the songs. I recommend you do this as well so that the humor is fresh. Overall, I found the show hilarious — one of the funniest I’d seen in a while. But then again, I got about 98% of the jokes because I’m familiar with the shows and conventions skewered. If you’re less familiar with theatre and Hamilton, you might not get it all. The reference to “Too Many Words” refers to the target of this parody: not Hamilton but it’s author, Lin-Manuel Miranda (FB). They comment on how many words Lin crams into a song and a lyric, his forced rhyming styles, his comparison to heroes like Sondheim and past shows. They highlight rap and hip-hop from previous Broadway shows (which wasn’t called hip-hop them, but was still highly patterned rhythmic rhyming). Over the bulk of the 90-so minutes, what one comes away with a sense of is their love of what Lin created. After all, you don’t see them making fun of High Fidelity, do you (and I happen to like that show). With respect to Lin himself, Alessandrini gets it mostly right. He identifies Lin’s major works, of course: In The Heights and Hamilton, as well as his work with Disney. But he misses the opportunity the other recent show that Lin had a hand in — and that started here in Los Angeles: Bring It On The Musical. As least to me (perhaps because I recently listened to the Broadway Backstory on the show), it was a big omission. Along with poking fun at Lin, Spamilton pokes fun at what Hamilton has become: a steamroller with overpriced seats, for which all are clamoring for tickets, and how the song and story entered the cultural vernacular (how often have you seen “in the room where it happens” or “tell your story”?) It also examines, albeit briefly, other recent Broadway shows of varying depth and quality, together with a number of past shows. For example, there is a reference to The Unsinkable Molly Brown, but I’m not sure who other than theatre nerds will get the joke. Molly Brown hasn’t had a revival since the early sixties when it opened. There also was the required reference to Barbra Streisand, although thankfully there is none of the usual references to Mary Martin or Carol Channing (although there is a Dolly reference). Unfortunately, the delay between writing this up and seeing the show (we saw it Sunday evening — the start of the headache cycle) means that some of the best jokes have faded from memory. This is why I now plan to get the cast album. What hasn’t changed is the memory that this is one of the few shows that had me really laughing during the show; my wife noted that she hadn’t wanted to see a show that night, but she really enjoyed it. That said something about how the humor of this parody hit the two of us — probably a representative sample of those who see too much theatre. It was able to cut through the trite and find the body, and then to parody and skewer that body in a truly hilarious way. I do recall that the production was jam-packed and non-stop, moving from parody to parody with nary a moment to catch your breath. Uhh, just like that other show over on Hollywood Blvd. Gerard Alessandrini (FB) directed his ensemble well, enabling them to move from characterization to characterization smoothly and to have fun with the material and the audience. The ensemble itself — Dedrick A. Bonner (FB), John Devereaux (FB), WIlkie Ferguson III (FB), William Cooper Howell (FB), and Zakiya Young (FB) keeps switching roles, but primarily play the actors behind the characters in Hamilton. But they have loads of non-Hamilton characters as well, and if there is anything that can be said about the ensemble, it is that they pull this off with talent, aplomb, and a lot of pluck. Given the constantly switching characters, it is hard to single anyone out — they are all that good. Added to the Ensemble for a specialty number or two are Glenn Bassett (FB) and Susanne Blakeslee (FB). Bassett primarily comes on as King George, but Blakeslee is more broadly credited as “Diva”, taking on a number of, well, white actresses: Glen Close, Barbra Streisand, Liza Minnelli, and so forth. The understudies for the show are Becca Brown (FB) and Elijah Reyes (FB). Working up this writeup on the cast (and thus searching for their bios), what strikes me is how “LA” this cast is, unlike most CTG / Ahmanson shows. This production is really an LA-incarnation of Spamilton with actors grounded in or originating from LA, unlike the New York visitors we often get. That’s a refreshing and good thing to see, CTG. The show was choreographed by Gerry McIntyre (FB), who made the movement seamless while still remaining very Hamilton-like. Music for the show it provided by an on-stage piano, which is not explicitly credited in the program, but which I’m assuming was being tickled by Music Director James Lent (FB). Music supervision and arrangements were by Fred Barton (FB), with additional arrangements by Richard Danley (FB). Gerard Alessandrini (FB) presumably wrote the lyrics as he is credited as the writer of the show, and there is no separate “music and lyrics” credit; he also likely adapted the songs as necessary. Production-wise, things are … simple. There’s no credit for scenic design because there really is none — there is just a poster of Spamilton that the actors can disappear behind. Everything else is done with props, which is why Glenn Bassett (FB) is also credited with being set and prop consultant. Much more important to setting the scene in this show is the costume design work of Dustin Cross (FB). I can’t vouch for accuracy with the shows they parody, but the costumes evoke enough similarity to identify the shows and that is what matters. They are also flexible enough to accommodate the large variety of characters portrayed by each actor. They were also all made by the CTG costume shop; these are not tour costumes. All of this is supported by the lighting design of Karyn D. Lawrence (FB) and the sound design of Adam Phalen (FB) [although, alas, the latter was marred in execution by a large amount of microphone static at our performance]. Other production credits: Andrew Lynford, CSA – Casting; Lindsay Allbaugh (FB) – Associate Producer; Brooke Baldwin (FB) – Production Stage Manager; and Maggie Swing (FB) – Stage Manager. Note that, although this is a local production, it is also the start of a tour. Although Spamilton in New York is closing, Spamilton in Los Angeles has extended to January 7, so disregard what is on my graphic. Tickets are available through the CTG website; Spamilton is on Goldstar, but is sold out. TIckets don’t appear to be available on TodayTix. So, although they are less expensive, Spamilton tickets are harder to get. It is well worth seeing. Thanksgiving Weekend will bring Something Rotten at the Ahmanson Theatre (FB). November concludes with the Anat Cohen Tentet at the Saroya (the venue formerly known as the Valley Performing Arts Center (VPAC)) (FB) and Levi (a new Sherman Brothers musical) at LA Community College Caminito Theatre (FB). Have you ever had an invited guest in your house who overstayed their welcome? A person whose visit you looked forward to initially, but who threw your home into disarray and your life into shambles? Someone with such an inflated sense of self that they believe the world revolves around them, and they never see the damage that their meddling can create in the lives of others? Someone who is a master manipulator of people and can convince them to do whatever they want them to do, no matter who gets trampled in the process? That’s not something that would never happen in real life. No, never. Right? No, I’m not vaguebooking again. Rather, I’m describing the key underlying premise of the classic Moss Hart and George S. Kaufman comedy that we saw last night at the Actors Co-op (FB): The Man Who Came To Dinner. Originally written in the mid-1930s by two renowned playwrights for their friend, Alexander Woollcott, a famous theatre critic and star of a popular radio show, the comedy describes an exaggerated situation that without the exaggeration happens far too often in households across the world. The Man Who Came To Dinner takes place in 1936 in Mesalia OH, right after famed radio broadcaster and critic Sheridan Whiteside has come to visit the home of the Stanleys, but slipped on a patch of ice on the front step while entering. He is thus a prisoner of his medical condition, in a house in a town where he doesn’t want to be, with his executive secretary Maggie, for some unspecified period of time. Whiteside is a person who likes his life as he is used to it, when he is used to it, with whom he is used to it. Wherever he is, the world and the environment must bend to his will, for only if he is happy are those around him happy. Needless to say, this has drastically impacted the life of the Stanleys — Mr. and Mrs. Stanley, their children June and Richard, Stanley’s sister Harriet, and their staff — cook Sarah and butler John. Not helping the matter is an old-fashioned over-attentive nurse Miss Preen and the befuddled town doctor (who has written a play) Dr. Bradley. Now, add a plot complication in the form of local newspaperman Bert Jefferson, who comes to interview Whiteside but ends up getting involved with Whiteside’s secretary Maggie, who falls in love — and lets Whiteside know she is leaving. Of course, this would throw Whiteside’s world into further chaos, so he involves friend and actress Lorraine Sheldon to interfere. Let’s just say the results are predictable, given this was written by a man who wrote many Marx Brothers comedies. That last point means you have many additional characters show up who were essentially caricatures of personalities of the day, such as Banjo, Dr. Metz, Beverly Carlton. You also have wild absurdity, ranging from a cockroach farm, a delivery of penguins, an association with a home for paroled prisoners, and numerous telegraphs and name dropping with celebrities of the day. It is a classic convoluted comedy plot, with an incredibly large cast (19 people in more named roles than that) that you don’t often see in theatres these days (simply due to the cost of the actors alone, unless you are exempted by some sort of agreement with Equity). You can read a more detailed description of the plot on the Wikipedia page. How does one assess a story like this, especially in the present day? In its day, this was a classic situation comedy: extended silly situation, overdrawn characters (i.e., exaggerated characteristics), classic tropes. It certainly was the basis of many a sitcom: acerbic wit stuck in a place they didn’t want to be, meddling to get what they want. It certainly is funny today for the same reason. But at the same time, there are troubling intimations of its time that might not fly today. Whiteside constantly makes jokes about the sexual behavior of his nurse. Banjo pulls her onto his lap, despite protestations. In the context of the time of the play, they are funny; but in today’s Harvey Weinstein / Kevin Spacey world, our enlightened modern mindset keeps us asking: “Should I be laughing at that?”. Looking back with today’s vision, we know the type of man that Sheridan Whiteside is, and how much he respects the will and wishes of others. This is the dilemma of classic theatre: it is a product of when it was written, and makes a statement of that time. The Man Who Came To Dinner, while still very funny on its surface, is also a statement. It is a statement about what can happen when bad behavior is allowed to continue unchecked. It is a statement of how men perceived to be powerful treat the people around them. The story of Sheriden Whiteside might be very different had it taken place today. Is a story like The Man Who Came To Dinner worth seeing today? I still think so. It is still an excellent comedy with great lines; asking if one should skip it because of today’s sensibilities is like asking if one should no longer watch The Marx Brothers do their comedy. Enjoy it. Laugh. You certainly will with this production. But be aware with today’s mind as well, so that men like Sheridan Whiteside can’t behave like that today. Director Linda Kerns (FB) has worked with her acting team to capture the broad caricatures of these characters in the cast, including the clear references to the Hollywood and Broadway and Radio personalities that inspired them. I’m sure this required some education of the younger generation who (alas) are likely less familiar with the greats of the 20s, 30s, and 40s. She also got the movement and the blocking down well, which isn’t easy in this large cast on a small stage with clear limitations. In the lead position was Greg Martin (FB) as Sheridan Whiteside. Martin captured the character quite well, with all the requisite bluster and wit required. In his bio, it is noted that in his day job he’s a Deputy DA, so I wonder if he built his characterization on some of the people he has seen in court. Playing off of Whiteside in the Girl Friday role of Maggie Cutler was Natalie Hope MacMillan (FB★, FB). MacMillan created the proper sense of both competence and girlishness required, and was a believable couple with Connor Sullivan (FB)’s Bert Jefferson. The Sullivan family, who were hosting the Whiteside entourage, consisted of Mr. and Mrs. Stanley (Lawrence Novikoff (FB) and Deborah Marlowe (FB)), Mr. Stanley’s sister Harriet Stanley (Brenda Ballard (FB)), and their children June (Lila Hood (FB)) and Richard (Kyle Frattini (FB)). Each captured their unique characteristics well: Novikoff capturing the exasperation, Marlowe the adulation, Ballard the kookiness, and Hod and Frattini the youthful naivete. Also drawn and performed as the appropriate broad caricatures were Jean Kauffman (FB)’s Miss Preen (the nurse) and Irwin Moskowitz (FB)’s Dr. Bradley. Each knew how to work the characters for the laughs they were designed to get. Most of the other actors had multiple characters, often with one primary. Most notable among these was Catherine Urbanek (FB), who in addition to playing the one-scene character Mrs. Dexter in the first act, gets to be the standout actress Lorraine Sheldon. In the latter role, what is most notable about Urbanek’s performance is how she has two characters — the real Kansas City actress and the phony Lorraine character, and uses a clearly different voice for the two personas, which is interesting to watch. Also doubling as acting friends of Whiteside are Wenzel Jones (FB) as Beverly Carlton (also Convict Michaelson, Plain clothes man, and a choir person). As Carlton, he only really has one scene but handles it with quite a bit of humor. Lastly, as Banjo (a clear Marx Bros. parody), John Allee (FB), captures the Marx Bros. zaniness well; he also portrays “Radioman” and “Baker”. Most of the other characters don’t have strong individual characterizations, but are captured well by their actors: Kevin Michael Moran (FB) [Metz, John the Butler]; Karen Furno (FB) [Sarah the Cook]; Goreti da Silva (FB) [Mrs. McCutcheon, Wescott]; Hunter Lowdon (FB) [Convict 2, Expressman, Choir Person, Deputy]; and Chris Savell (FB) [Sandy, Convict Henderson, Choir Person, Deputy]. Catriona Fray (FB★) was the Lorraine U/S. Turning to the production side: Nicholas Acciani (FB), who just received an Ovation nomination for his design of 33 Variations, designed the set, which was a reasonable portrayal of an upper-class Ohio household in 1936. The arrangement of rooms and props worked well to eliminate excessive crossovers and permit hiding of some of the outrageous deliveries. It was supported by the props of Ernest McDaniel (FB), Property Master. I particularly noticed the Egyptian sarcophagus in the final act, and I wonder if it was purchased from the Colony Theatre as they cleaned out their lobby. Shon LeBlanc (FB) did the costume design, and Amanda Walter (FB★) did the hair and makeup, most of which worked well (there were a few cases where the wigs looked a little wiggy). Sound and light were done by Warren Davis (FB) and Andrew Schmedake (FB), respectively, and both did a great job of establishing place and mood. Rounding out the production team were: Rita Cannon (FB) [Stage Manager]; Thien/Tintin Nguyen/FB [Assistant Stage Manager]; Nora Feldman [Publicist]; and Thomas Chavira (FB) [Producer]. 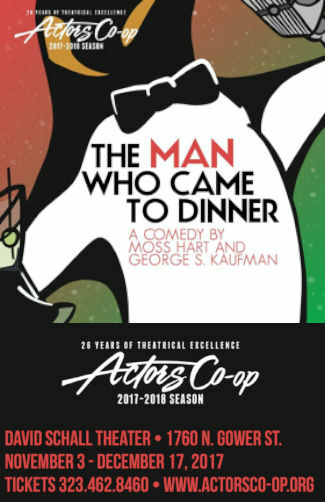 The Man Who Came To Dinner continues at the Actors Co-op (FB) through December 17, 2017. Tickets are available online; discount tickets may be available through Goldstar. This is a very funny show that, while perhaps a bit dated in tone and attitude, will still have you laughing in your seats. There are many ways that I discover the shows I go see — especially the non-musical plays. Most often, they come through a season subscription — rare is the small company that only does musicals, and so the artistic director’s vision introduces me to new plays. Occasionally, I know the playwright, such as with last week’s Mice. Even less frequently I’ll discover a play from one of my various theatrical feeds (Playbill, Broadway World, Bitter/Better Lemons). Even rarer is the publicist’s missive that catches my eye — typically because there’s something in the subject matter of the play. That’s what happened with Company of Angels (FB)’s This Land, which we saw last night. The publicist, Susan Gordan (FB), sent a proposal for an article describing an upcoming world premiere. The pitch was: “a rich story spanning over 150 years about four families with ancestry from different parts of the world (Tongva Indians, African, Mexican, Irish) who make their home on one particular plot of Southern California land now known as Watts. A host of old curses and blessings, traditions and recipes, loves and betrayals travel down family lines from the 19th to the 21st century, forcing each successive generation to ask in times of hardship, “Should I stay or should I go?”” Little did Susan know that although I might appear to them as a theatre reviewer because of this blog, I’m really a cybersecurity guy who not only loves theatre but who also has an intense interest in history — especially California history (which anyone who reads my highway pages knows). I’m a native Angeleno (Los Angeles native, for those not familiar with the term) who has been studying Los Angeles history for years — not only just freeways, but transit, city growth, water, and city politics. This was a show on a topic that was truly of interest to me. So even though I couldn’t find discount tickets, I got tickets and went. I am really glad that I did. This Land is — to date — I think the best play I’ve seen all year, and it is close up there for best show (and that’s putting it against Hamilton). Especially if you love history or love Los Angeles, this is a play that you must see. It tells the story well, it educates its audience, it makes the audience think and see the city in a different way. It does what a play is supposed to do: tell you a story, draw you in, and not only entertain but elucidate. Additionally, it also does something to address a common complaint about theatre in Los Angeles: It tells a story about Los Angeles, to audiences that reflect Los Angeles. Let me explain: There are very few plays — and even fewer musicals — that tell Los Angeles stories. Just ask yourself: What shows do you know that tout the New York experience, are centered in New York, or that focus on New York? Now ask yourself the same question about Los Angeles. See my point? Los Angeles has an extremely rich cultural history, significant historical events, culture clashes and milieus. Yet Los Angeles is viewed by playwrights often as a collection of suburb in search of a city, a shallow car culture (witness Freeway Dreams from earlier this year). There are a few plays that touch on nostalgia (such as Bruce Kimmel’s LA: Then and Now, or the even earlier Billy Barnes’ LA). The large LA theatres rarely commission or present shows about Los Angeles (a major complaint of the LA Times critic). There are the occasional shows, yes — A Mulholland Christmas Carol occasionally resurfaces, and of course there is Zoot Suit, which packs them in at the Mark Taper Forum (which we saw in February). Further, the Los Angeles theatre audience is often unfortunately predominately a single shade, and aging (I’ve complained about this before: how the complexion of an audience changes only when the subject of the play is about that group’s experience — and that’s wrong). Yet This Land was not only a story about the diversity that is Los Angeles, it reflected the diversity of Los Angeles in the casting, and even more significantly, reflected the diversity of Los Angeles in the diversity of the audience — a melting pot of ethnicities and ages and genders. This is a play that touches and speaks to the diversity that is Los Angeles, that speaks to young and old, to the recent immigrant and the long time resident. Further, it turns out that this is a commission from the Center Theatre Group (FB), one of the largest non-profit theatre groups in the city, being produced by Company of Angels (FB), the oldest non-professional theatre company in Los Angeles, founded in 1959 by a group of television and film actors that included Richard Chamberlain, Leonard Nimoy and Vic Morrow, with a revised mission to provide a space for the voices and audiences neglected by the major regional theaters. This is not only theatre in Los Angeles, it is Los Angeles theatre — about Los Angeles, reflective of Los Angeles, speaking to Los Angeles. This Land is a story that spans 150 years in a community in South Los Angeles called Watts. It is a small area, roughly bordered by 92nd Street on the North, Imperial Avenue on the South, Central Avenue on the West, and Alameda on the East. You might have heard of Watts: it was the location of the Watts Riots in 1965, and the Rodney King riots in 1992. It was one of the original suburbs of Los Angeles. It started out as the site of the Tongva village, Tejaawta, and became part of Rancho La Tajauta in 1843. It was incorporated into the city in 1926. Like Boyle Heights, this was a community that welcomed the worker. After the Tongva and the Mexicans, there came the American farmers and waves of farmers moving west around the depression. In the 1940s, it was one of the few communities in Los Angeles that permitted African-American residents (Los Angeles has a nasty history of restrictive covenants and red-lining, which affect the city to this very day). The influx of the black community had an impact on the existing white residents (again, another common nasty history in Los Angeles). With the growth of the hispanic communities in Los Angeles in the 70s, 80s, and 90s, Watts changed again. Now, with the rebirth and resurgence of rail in Los Angeles (Watts was along one of the original transit backbones of the city, and is again), combined with affordable prices and gentrification, well, you know what is happening and who is being pushed out, with no affordable solutions. That history is the background and setting of This Land. It tells the intertwined stories of five families representative of the various eras of Watts: the original Tongva settlers interacting with the first Missions and Ranchers in 1843 (Tomas, Toya, and Enrique), the first influx of the Americans in 1848 (Patrick), the first black families moving into the area in 1949 and later in 1965 (Maeve and James, Leola and Leslie), the transition as the hispanic families change the communities yet again in 1992 (Fidel and Ricardo, Sharon and Mel), and the wave of gentrification as developers purchase homes from families to transform the area yet again in the near future of 2020 (Ricardo, Della, and Dalton). The storytelling is intertwined, moving back and forth between the historical periods. It shows how — in true LA fashion — there was hatred when new cultures came in, yet eventual cultural transfer of ideas and food. It showed the importance of water to the city — not only was the LA river near Watts, but Watts was one of the few areas in the city that was able to draw water from artesian wells. It highlighted the discrimination and restrictions that existed in the city not only for the people one might think of as minorities — the blacks, the hispanics — but other groups as well, such as the Jews or the Dust Bowl Refugees. It really speaks to the multicultural story of the city — not of a predominately single ethnicity experience as was seen for the 1940s Pachucos of Zoot Suit, or the rose-tinted nostalgia of the Los Angeles reviews such as Los Angeles: Then and Now (which tend to look back on kitsch and ephemera, and not the painful ugly aspects). For many LA plays, the ugly aspect is the gay history of the city — but there is much more ugliness under the surface. It also captures well the little LA things, from Dy-Dee Diaper service to the importance of the Aerospace industry and the automotive industry (and how the decline of both drastically impacted minority communities in the city). Playwright Evangeline Ordaz (FB) has crafted a story that drew me in and kept me enthralled up to and including the closing scene. From my knowledge of the history, it captured things quite well. Interconnections that could have come off as forced coincidences don’t — they seem to flow well and a naturally, and work to highlight the impact of the story and show the ultimate connectedness of people to each other and to the land. Director Armando Molina (FB) handles the small cast in this large story well. Almost every actor portrays multiple characters for the different eras, and the performances are so distinctly different that in some cases I actually left thinking there were additional actors and one had been left off of the program. That is how well this director worked with the actors to individualize each performance to the character, and to make the characters believable. Very very well crafted both in the story and the stage realization. As for the acting ensemble, what can I say but: I was impressed by their ability to become their characters. Unlike most shows, I can’t discuss them in tiers because this was a true ensemble — performances of approximately equal size and weight across the story. So let’s work across the eras. Beginning in 1843, we have Toya (Cheryl Umaña (FB)), the Tongva village leader whose father, Tomas (Richard Azurdia (★FB, FB)) has gone to the Mission. There is also Enrique (Jeff Torres (FB)), the son of the rancher whose lands are encroaching on the Tongva village lands. There is also Pepe (Niketa Calame (FB)), the Mexican soldier who is helping Enrique. All are strong here, but the central relationships are Toya and Tomas, and Toya and Enrique. Umaña is great as Toya, trying to understand a culture and communicate in a language and with a changing world she does not understand. Torres is also spotlighted here as the rancher trying to do right by both the mission and Toya’s father, Tomas. As Tomas, Azurdia has a great portrayal of a man who tried to do right for his village, but who was broken by the Mission system (which was the beginning of poor racial relations in the City of the Angels). Moving to 1848, we meet Patrick (Ian Alda (FB)) , an Irish-American soldier coming to the land with the Americans, as the days of the Mexican land grants are waning. This is a smaller era in the story, but Alda captures the Irish aspects well. Jumping to 1947 and 1965, we meet Maeve (Johanna McKay (FB)), a white woman living in Watts who moved there during the depression-era dustbowl migration, and her new black neighbor, Leola (LeShay Tomlinson (FB)), who has just moved from Louisiana. Both were remarkable performances. McKay captures well the woman whose neighborhood is changing but sees her neighbors as people, not their skin (an attitude that, unfortunately, wasn’t too common). Tomlinson gives a wonderful portrayal of a woman who has escapes the overt discrimination of the South only to run into the covert discrimination of the West — or to paraphrase as she put it, in the South they are at least racist to your face, not behind your back. She also captured the proud woman just trying to do the best for her family while dealing with the changing circumstances of life (and I knew many people like that — both friends and parents of friends from those areas). By 1965, the children are added to the mix: Maeve’s son James (Ian Alda (FB) in his 2nd role), and Leola’s daughter Leslie (Niketa Calame (FB) in her 2nd role). These two capture well the angst of their era: Alda capturing well the young white adult in Watts who wants his parents to move somewhere “safer” (which, yes, is code we still see today), and Calame capturing the young adult trying to make changes in society. Turning to 1992, we are dealing with the children of the prior era, and yet another transition. We have Leslie’s children Mel ((Niketa Calame (FB), in her 3rd role) and Sharon (LeShay Tomlinson (FB), in her 2nd role). Maeve has moved out, and moving in is a HIspanic family with a taco business, Ricardo (Jeff Torres (FB)) and Fidel (Richard Azurdia (★FB, FB), in his 2nd role). All of the performances shine here. Calame was spectacular as Mel, the young woman trying to make friends and accept her new neighbors, seeing them as people and not their skin. This was in contrast to her sister, Sharon, as portrayed by Tomlinson (who I didn’t even recognize as the character, the difference was that distinct). Tomlinson’s Sharon was more antagonistic, not trusting the new people in the neighborhood and moving to violence as the solution. Next door we had Azurdia’s Fidel and his Taco Truck, which was just a realistic and very human portrayal that could easily have gone stereotypical. Lastly, we had Torres’s Ricardo — a young man who was just trying to fit in the neighborhood. All great performances. Lastly, there was 2020, where we had Dalton (Ian Alda (FB) in his 3rd role), James’s son, attempting to buy back the land and the houses from Torres’ Ricardo and Della (Cheryl Umaña (FB), in her 2nd role), Mel’s daughter. Smaller scenes, but still strong performances capturing the residents of today seeing the developers come in to try to move them out, with no place they could afford to go. Simply put — all great performances. Turning to the production side: This was Company of Angels (FB)’s first production in their new space at Legacy LA (FB) at the Hazard Park Armory (interesting history of its own) next to County-USC Medical Center. This is an expansive warehouse space creating one of the largest stages I’ve seen for a small company. Justin Huen (FB)’s scenic design worked well in the space, creating a backdrop for Benjamin Durham (FB)’s projection to establish the place, with the scenic design creating the house spaces, the truck spaces, and the land and river spaces well. This was augmented by Huen’s lighting design that created time and mood. Manee Leija‘s costumes (which presumably included hair and wigs, as there wasn’t a distinct credit) distinguished the characters well, although I can’t vouch on authenticity. Rebecca Kessin (FB)’s sound design amplified (get it, amplified 🙂 ) the environment, and provided the cues for the transitions. Rounding out the production credits were: Daniel Muñoz (FB) – Stage Manager; Heather McLane (FB) – Asst. Stage Manager and Prop Design; Susan Gordon – Publicist; Tamadhur Al-Aqeel (FB) – Producer. Company of Angels (FB) is under the Artistic Direction of Armando Molina (FB). 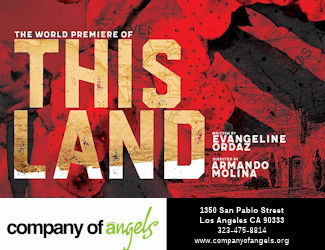 The World Premiere of This Land continues at Company of Angels (FB) through November 13. The remaining performances are Fridays at 8pm on Nov. 3 and 10; Saturdays at 8pm on Nov. 4 and 11; Sundays at 7pm on Oct. 29, Nov. 5 and 12; and Mondays at 8pm on Oct. 30, Nov. 6 and 13. Tickets are $25; senior $15; students $12; Monday performances are Pay-What-You-Can. TIckets are available through the Company of Angels website or possibly calling 323-475-8814. Discount tickets do not appear to be available on Goldstar. I have seen a reference that code “COMUNIDAD” may give a discount, but I don’t know if it was efffective (I paid full price). This is one of the best shows I’ve seen all year, followed closely by Hamilton and Zoot Suit. Go see it while you and, and learn about our great city.